The gray stain was caused by heating the pan for over 5 minutes after the boiling water in it was boiled away because I was momentarily (5+ minutes) distracted away from the cooking range. Is there a method and a special compound/solution which I can use to restore the appearance to its nearly new shine instead of the dull gray look? Is the pan still usable in its present state? 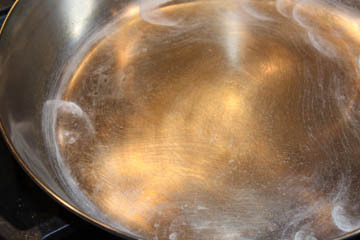 Will there be release of any metallic toxins because of the overheating of the pan in its dry state? I’ve also had people contact me directly with the same problem and concerns about any ill health effects. To answer her last question first, it is worth noting that it is unlikely that anything related to the stainless steel will cause health problems. I have friends that are nervous about stainless steel because it has chromium in it, but the type of chromium used in stainless steel, chromium III, which provides the corrosion and discoloration resistance stainless steel is known for, is completely unlike the very deadly hexavalent chromium made famous by the film Erin Brockovich. In fact, chromium III is required by the body in trace amounts for proper digestion of sugars and fats. 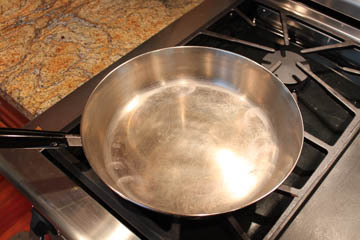 In terms of the health of the cookware, it is always a bad idea to heat a pan without anything in it for an extended period of time, because this will likely warp the bottom of the pan, effectively ruining it. To determine an effective repair for any discoloration, I set out to duplicate the problem. Heating the pan without anything in it for a good 15 minutes didn’t cause any discoloration at all, but it had a pretty harsh affect on the copper bottom. The extreme heat caused little pieces of the copper bottom to flake off and made the bottom rough to the touch. Next I tried the experiment with some water in the pan, let the water boil off and heat for a good 10 minutes after the water was gone. This time there were burned on hard water stains and some iridescent discoloration. As we don’t have particularly hard water where I live, I suspect this would be much worse where there was very hard water, and probably the cause of the discoloration in question. I have gotten pans in such shape from thrift stores and the solution below also did wonders on them. While any warping caused by such heating will likely be permanent, the stains and discoloration on the inside of the pan are fairly easy to correct: simply scrub well with a Scotch Brite pad (never use steel wool or SOS pads) and then polish with some Bar Keepers Friend. Looks much better. It is important to note that a Scotch Brite pad should NOT be used on the outside of the pan as it will dull the finish. 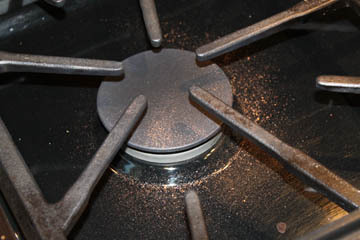 The inside of any pan will become dulled anyways from use, so a Scotch Brite pad won’t hurt it any worse. The bottom was more difficult to polish; I tried Bar Keepers Friend and copper polish, but the roughened surface due to the over heating made it more difficult to get good results. 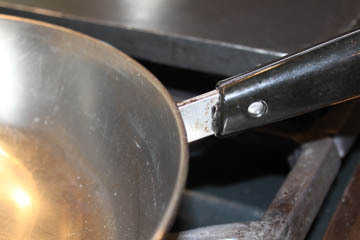 There is one more danger to overheating pans; the Bakelite handles can break down at high enough temperatures. This particular test resulted in some slight breaking down of the Bakelite material where it touched the metal. I was very concerned about using my revere ware to cook acidic food and wondering if it does react with acid as aluminum cook ware does . 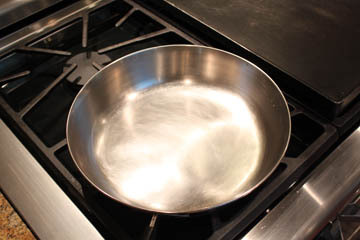 Aluminum in general is a poor choice for cookware given its reactive tendency (such as with acidic foods) and the uncertainty about health issues with aluminum exposure. Stainless steel has none of the same issues as aluminum (none of the elements in stainless steel have health concerns) and is non-reactive with acidic foods. Well, I did use a Brillo pad, Comet and a scothbrite-type pad. no results to the burned out water in my pot (small, 1 qt size) MAybe I made it worse with the Brillo and Comet. I know steel wool is bad to use on stainless steel because they can promote rust; I suspect Brillo pads are the same. If you tried a knockoff Scotch-Brite pad, try the real thing. You can also try Lime-Away or vinegar to break through the hard water residue. I can’t believe I found this! I have boiled out water in more than 1 revere pan. (whoops!) and as they were my mother’s and my favorite pans, I didn’t want to get rid of them. THANKS! I have always used sos on my pans. I guess I should stop. Additional question: It looks in these pictures as though some of the copper has come off. “Flaking” So–if that’s the case, is there more copper underneath that stayed? or is the copper-bottom no longer copper, and therefore not as useful? How much copper there is depends on the vintage. 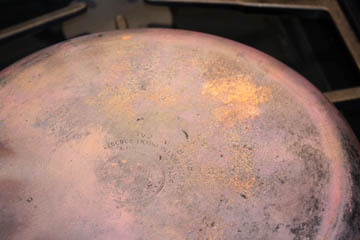 The pre-1968 era pans have quite a lot of copper so a little flaking off will not likely change the pan much. However, the newer stuff often has a layer that is very very thin (cosmetic only) and doesn’t do much for spreading the heat like the original era pans did. I’ve heard many stories of this copper simply wearing off after a moderate amount of use. I sell alot of Revere ware on eBay. If you have discoloration on outside pollished stainless steel. You can run a buffer wheel to clean them up. It also does wonders for the copper bottoms. It removes all sctatches. I did how ever put them in dishwasher and they turned green. I resolved this issue by rebuffing the bottom copper then used a polish brasso and it never turned green again. The brasso had oils in it to keep the copper ffrom turning green in the dishwasher. The buffing wheel will clean all grime off the whole outside of the Revere ware. Just make sure to use a polish to finish the job. Are the oils in Brasso OK to use near food? I might suspect that they are not. For something like this it is always helpful to look at the materials safety data sheet (MSDS) for a product. You can find the one for Brasso here. when not in use. Contains petroleum distillates and silica. So, probably best not to use near food. However, I’ve seen indications that simply washing something well with soap and water will get rid of any residue. 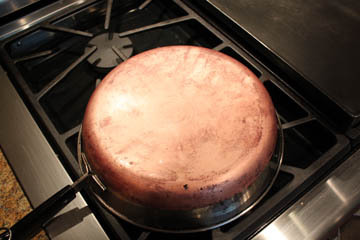 Hello RevereWareParts — What do you suggest to do for flaking copper on the bottom of a pan that has overheated? There really isn’t much to do except scrub it with a non-scratching scrubber to get any loose flakes off, and then polish it really good a couple of times with copper cleaner.